Letters to my future grandkids: Who's Holding the Cards? Sometimes you can think you are winning when really someone else is holding the cards you need to succeed. Your great-grandpa had a devious streak to him. One time while camping at Yosemite National Park we were playing a card game in the evening. In the game, Pit, you all try to get a hand full of the exact same card by trading the cards you don't want with other players. Everyone trades at the same time by holding cards face down and shouting out the number of cards they have to trade. It's loud and hectic and crazy and fun. 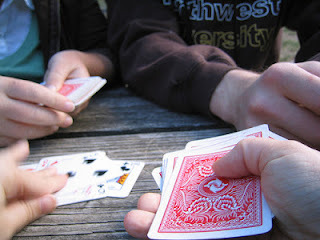 So there we are at the picnic table in the campground frantically swapping cards. I'm getting excited because I only need one card to have a complete hand full of Barley for the win. I keep shouting "one, one, one, one, one" as I hold out the corn card that I need to trade away. And I keep grabbing a card from another player, glance at it eagerly only to see that it isn't Barley but yet another Corn. So I try again, yelling just a little bit louder. I trade again, and again it is Corn. But I'm so close to winning. Almost everyone at the table is frantic just like me. Everyone is trading one card only. And that one card is always Corn. But we are all so caught up in the fact the we are about to win if we just get the one right card that none of us notice this fact. Suddenly Dad starts laughing. We all keep trading our single Corn cards around the table sure we will win any second. Dad laughs harder. We look at him with annoyance. "Just stop" he says. "None of you can win." He exposes his hand which contains precisely one of each of the cards. There is my desired Barley, along with mom's longed for Wheat, my sister's needed Rye and so on. "I wanted to see how long it would take you to realize that none of you could win. I figured eventually you would realize that you were all trading the same card. Finally I gave up on you ever figuring it out." He laughed some more as we all sat there chagrined. When we calmed down, we continued on with the game briefly until the park ranger arrived to tell us to cut it out for the night as we were disturbing the other campers. Sometimes you can be so focused on a goal and think you are so close that you can miss all the obvious signs around you that someone else is holding the cards and you can't succeed just by doing more of the same thing you have been doing.